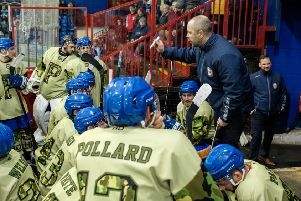 Phantoms coach Slava Koulikov admits addressing the club’s lack of goals is his biggest priority. The city side have found the net only 20 times in eight English Premier League outings so far this season. Only bottom two, Manchester and Bracknell, have lit the lamp on fewer occasions than a Phantoms outfit averaging just 2.5 goals per game. Koulikov has already drafted in an additional attacking import in Australian international Wehebe Darge, who drew a blank in his couple of Phantoms appearances last weekend. Koulikov said: “We’re still a bit dry in terms of goals and that is something we can hopefully address going forward. “We cannot just rely on the imports to score goals for us. It has to be a collective thing. “We’ve had a lot of conversations about it and I’m sure the goals will start to come if we all work as hard as we did against Telford last Sunday. One such example of that was last Saturday in Hull. Phantoms drew a blank in a 3-0 loss but turned their weekend around to beat Telford 4-3 after penalties the next night. Koulikov said: “The guys have shown they are capable of bouncing back from a disappointment. They did it in the opening weekend of the season, they did it in the second weekend and they did it again last weekend. Koulikov has spent this week in Slovakia with the GB Under 20 squad as they prepare for their World Championship event later in the year. Defenceman Tom Stubley and forward Connor Glossop were also involved in the training camp which featured two games as well as a series of practice sessions.